The current perception of democratic crisis in Western Europe gives a renewed urgency to a new perspective on the way democracy was reconstructed after World War II and the principles that underpinned its postwar transformation. This study accounts for the formation of the postwar democratic order in Western Europe by studying how the main political actors in France, West Germany and Italy conceptualized democracy and strove over its meaning. Based upon a wide range of librarian and archival sources from these countries, it tracks changing conceptions of democracy among leading politicians, political parties, and leaders of social movements, and unveils how they were deeply divided over key principles of postwar democracy – such as the political party, the free market economy, representation, and civic participation. By comparing three national debates on the question what democracy meant and how it should be institutionalized and practiced, this study argues that only in the 1970s conceptions of democracy converged and key political actors accepted each other as democrats with similar conceptions of democracy. 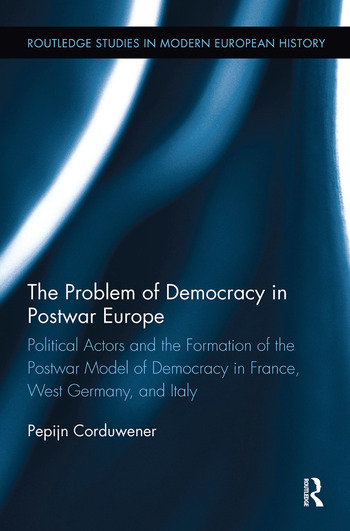 This study thereby deconstructs the myth of the quick emergence of one consensual Western European model of democracy after 1945, demonstrates that its formation was a long and contentious process in which national differences were often of crucial importance, and contributes to an enhanced understanding of the historical roots of the current sentiment of democratic crisis. Pepijn Corduwener is an Assistant Professor in History at Utrecht University.